In brief: It's been two so-so meals in a row at Manna, and yet we still keep going back. The lack of good Asian food in the Flatiron/Union Square area is killing us, which is why we keep going back to Manna Kitchen even though it's just ok. I've had two not-that-great meals in a row, first the tofu lunch box and today the beef bulgogi (I ask you, how can beef bulgogi be bland?). 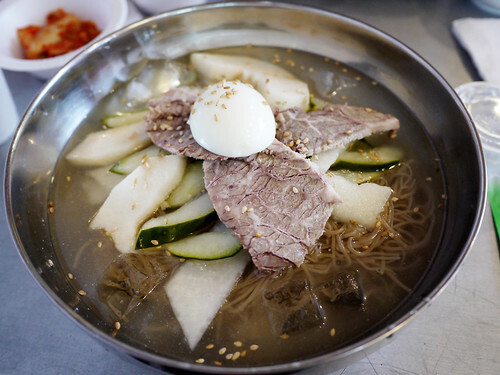 M. doesn't mind the naengmyun there and I think I had better go back to the hot stone bulgogi. You need to give KooFoo another try. Just a deli in front but reallly good korean in back. Try the Kmchi fries rice!